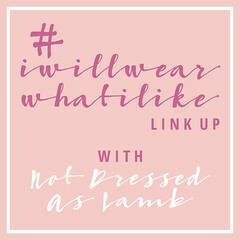 one of the original items on the list of “banned” things for the over 30s that kicked off the original #iwillwearwhatilike campaign back in August (scroll down for an explanation). I have quite a few rock/graphic tees: My beloved David Bowie t-shirt; the (very apt) 1972 Adidas t-shirt; the superhero-style Obama tee and my “Confidence is the best outfit” tee, amongst others. What I find crazy about this notion that women over 30/40/50 are too old for graphic tees is that the difference between a printed t-shirt and a plain one, or even a graphic tee and a patterned tee, is the matter of a bit of extra ink in a few different places. Unless you’re spouting some vile message via a slogan, what difference does it really make to anyone else if your t-shirt has some pattern or words on it? If someone has an issue with whether a mature woman’s t-shirt has a bit of extra print on it, then I reckon they must have very little to worry about in their own life if they’re concerning themselves with that with regards to someone else. Lucky them, eh…? Anyway – to far more important matters! 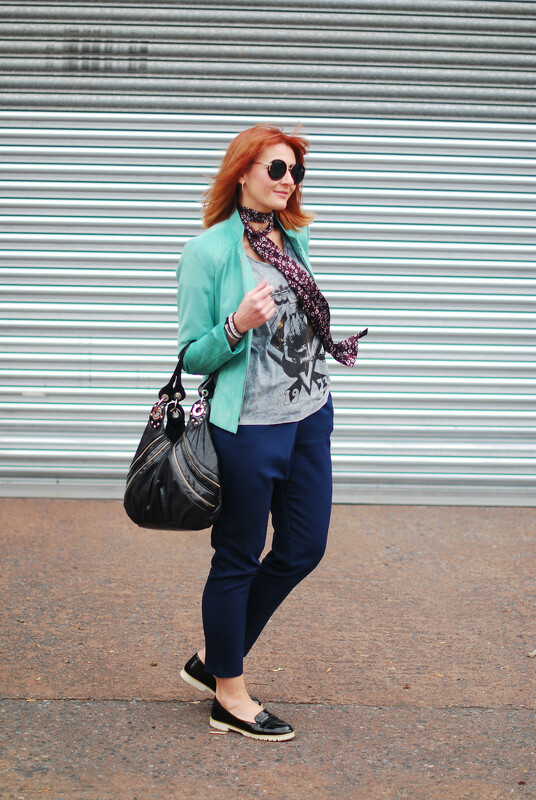 This is one of those mish-mash outfits that I really liked because of its contrasts: Biker jacket in mint, a grungey grey rock tee, smart navy trousers and a floral skinny scarf. Nothing new here except for the stunning Lizzy O snake print and diamante wrap bracelet – this adds that extra touch of bling and edge to an outfit and suited the mint jacket perfectly. 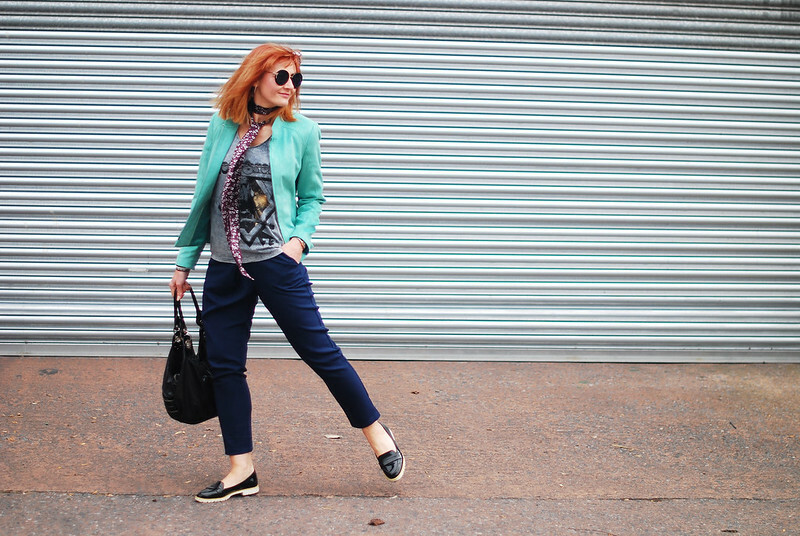 THIS IS ONE OF THOSE MISH-MASH OUTFITS THAT I REALLY LIKED BECAUSE OF ITS CONTRASTS: BIKER JACKET IN MINT, A GRUNGEY GREY ROCK TEE, SMART NAVY TROUSERS AND A FLORAL SKINNY SCARF. So do add your outfits to this week’s link up – don’t forget you may be featured next week if you’ve linked up an outfit with a graphic tee – that includes rock tees, logo tees and slogan tees too… Otherwise link up everything you’ve been wearing, old posts and new! DO YOU HAVE A COLLECTION OF GRAPHIC/ROCK TEES LIKE ME? DO TELL ME ABOUT YOUR FAVOURITES IN THE COMMENTS OR TWEET ME @NOTLAMB! Oh wow Sue Ellen – that's amazing!!!!!! Hi Catherine! Been away celebrating a Big Birthday, planning a big move and suffering a lack of Internet, so good to check in on this post. I will certainly join in this challenge with my AC/DC t-shirt. If a whole stadium of follically-challenged gents of a certain age 😉 can wear them, so can I :)! I really like this look as well. You know what a sucker I am for a graphic tee. Never too old! 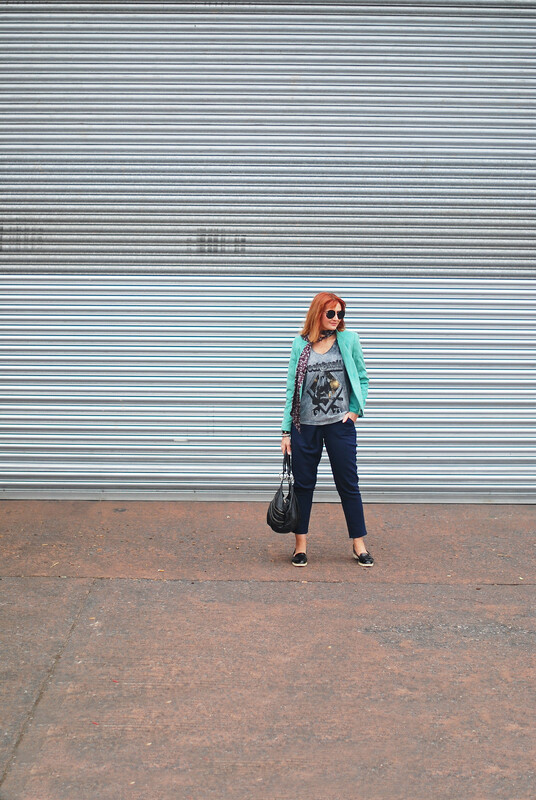 I really love the graphic tee, the design is right up my street being a bit of a rock chick! The neckline isn't too high, which is a bugbear of mine with some tees. The mix up of preppy and edgy is fab! Love your jacket and the way you put together your looks, Catherine. Always very inspiring to me ! Thanks for sharing your link-up 🙂 I gladly joined. I don't get what the big deal is about older people wearing graphic tees either. But I don't think it really matters, because everyone does anyway. People love to wear their favorite sports teams or bands on their chest with pride! I don't have any band or sports graphic tees, but I do have lot of tees with designs on them. A solid colored tee is just too boring. Cute outfit! I love your pants. Such a fun look Catherine! Considering the fact that I have a rather healthy graphic tee collection, it's apparent I'm not really concerned with the fact I "shouldn't" be wearing them either! Can't go wrong with a graphic tee as cute as this – Have a lovely week! I do love a great graphic tee and always want more but have to stop myself since I can only wear them on the weekend! Suzanne Carillo made one of my favourite graphic T's ever: Dressed to piss you off! Heh heh. It fits well with your theme. But I linked up my own DIY graphic T this time – so glad my post coincided with this theme. The look you're wearing here is one of my faves on you – casual, strong-minded, going places. And you could whack someone with that bag if you needed to (hope you don't!). Love it. Actually, now that you mentioned it, I realized that I do not have any graphic tee, and it's true that there are not many mature women wearing them. I wonder why? I personally do not wear them because my bust is too big and I am afraid that such a tee would emphasize it too much ;)Your new pants stole my heart! Although I don't own a graphic tee (linked up my new printed top though) you are so right, again it has nothing to do with age and I love how you styled it. A stylemix became my favourite style anyway!! The bracelet is the perfect accessory with your look and I also have to check out your shopping links as I love your shoes. 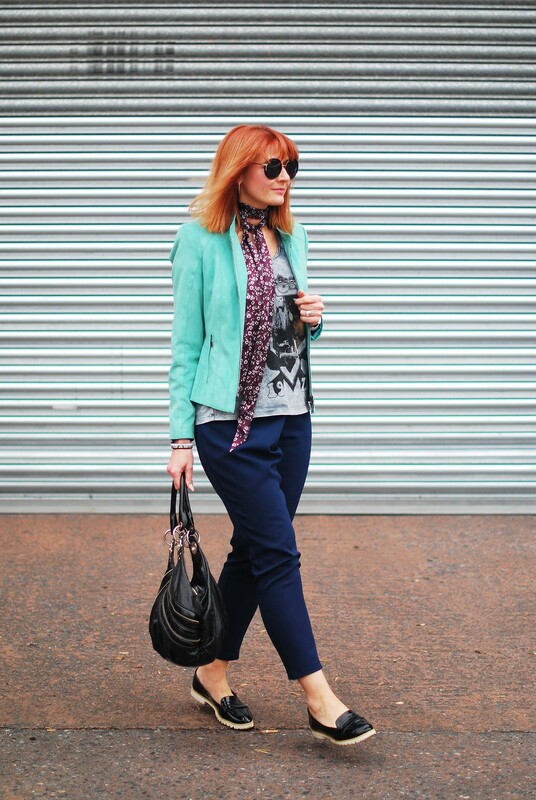 You are def rocking this look but I am in love with that scarf, what a great touch to complete the outfit! Oh yes, In love to wear my Siouxie and the Banshees tee on my leather pencilskirts! OMG a Siouxie Soux tee would be awesome!!!!!!!!! Lovely yellow outfits last week. So many familiair faces who won the week. As for graphic T's… I like your casual and still smart look. Love the shoes. Very pressed for time lately. I always look forward to your link up, dear Catherine. Thank you for including me in your featured favourites! I love graphic tees, and I think I have a few. Or tees with prints, why not? Another ridiculous 'rule' well and truly put to death Catherine! And that green jacket you've styled your tee with works a treat. I still wear graphic tees, though mine tend to have Minions on them – I refuse to grow up, EVER!! I wish I kept all of my concert tees! Whitesnake, ZZtop, Journey, I had alot as I was an avid concert goer as a kid. I miss going to concerts that dont run $300 a pop! 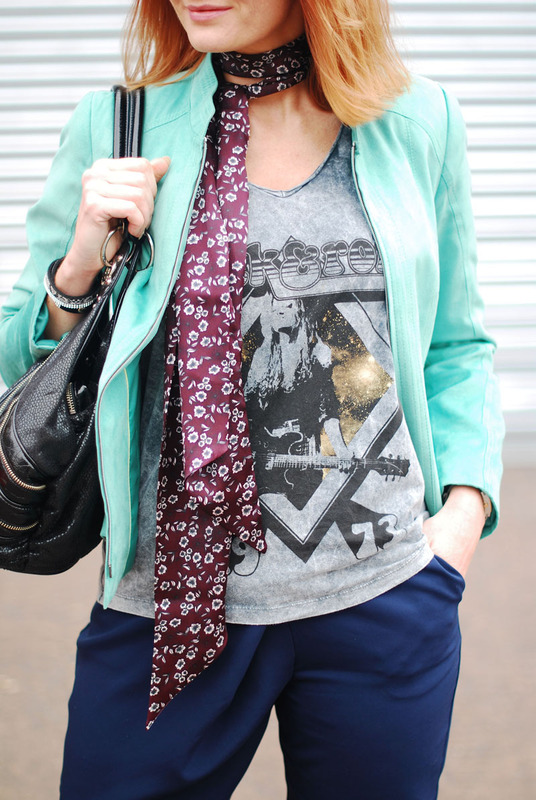 Love the tee and such a fun look, the bright greenish mint blazer is perfect color on you and love the scarf tied for some extra fun! Looking great! OMG I LOVE that mint biker jacket!!! And it's even especially more gorgeous with the navy pants. You never fail to impress with your amazing combos, Catherine! You're such an inspiration. It was really fun having something to 'aim for', for today's link up! And it was the first time I'd managed to wear my graphic Harry Potter tee!! Graphic tees are probably my fav thing on the "don't" list … they're just fun and casual … with a sense of humor. 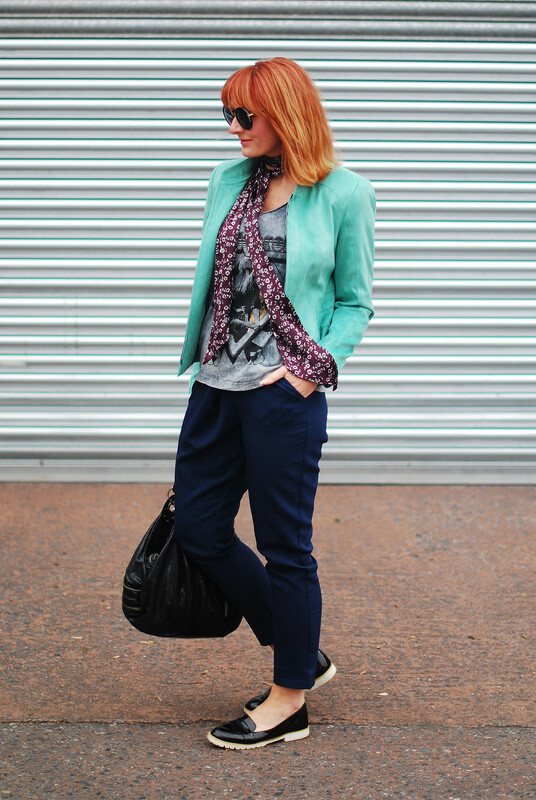 Great styling and thanks for the fabulous link up! I love a good graphic tee,I have one slogan tee in my capsule. They're just so wonderful to wear for adding a little bit of interest to an outfit. You my dear, looking marvellous. Your hair is just phenomenal lately. I can't believe you've not had a full fringe for all this time and yet it completely and utterly suits you! As always thank you so so much for hosting, a pleasure to participate. Rachel thank you!!! 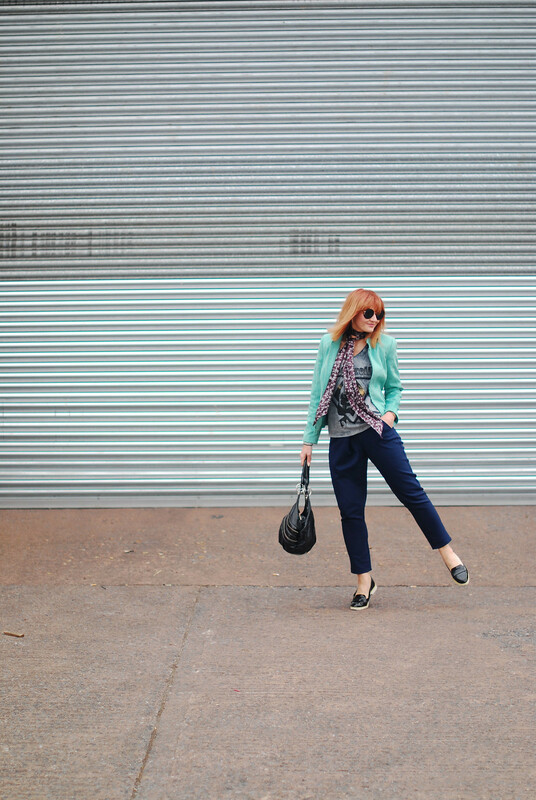 I thought it was about time I dug out the mint jacket again – I'm so glad I did…! I only just bought a graphic t-shirt—I used to think they were too "casual" and not very sophisticated! Ha—how wrong I was! Thanks so much for including me in your featured favourites!